Love, heartache, and obsession consume our thoughts on Valentine's Day, but they are always a part of Tegan and Sara's music. The Canadian twins’ new album Sainthood was inspired from Leonard Cohen's lyric, "I practiced all my sainthood." 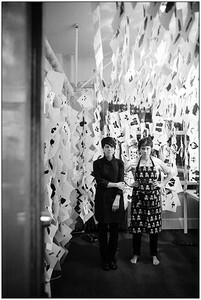 The duo performs March 5th at the Fox Theater, SF Station spoke with Tegan about Sainthood, her sister, and growing up. SFS: Were you and Sara in the same schools growing up? T: We were until we were in grade four. We moved to a new school and I think we were both pre-teenage and felt really weird about being split up, so for the next two or three years we were in the same class. My mom hated it. We would come home with the same stories, same experiences, and we would be competing with one another. I think having Sara there didn't allow me to forge for myself because she was really protective of me until we were teenagers. They tried to split us up as much as they could. SFS: So Sara was the protector because from the critics' standpoint a lot has been said about how you are more vocal and Sara is more quiet. T: We definitely swapped at some point. It's hard to pinpoint when that was. SFS: I grew up in grade school with a pair of identical twins, and I remember them pulling a prank on April Fools Day by switching classes. Did the two of you ever do that? T: No, neither of us felt like we were similar enough to pass off as one another, though I'm sure we could have. Especially in high school, all of our teachers were sitting up front passing out pamphlets waiting for retirement. The gag would have gone unnoticed. SFS: You mean teachers in Canada are waiting for retirement as well? I thought that was only a California thing. T: We went to an inner-city school, so there wasn't much inspiration there. SFS: Are you and Sara competitive with each other? T: I don't think so, at least not musically. The things that Sara and I excelled at were stuff where we did have one-on-one attention or smaller groups. We were in piano lessons. We trained classically since the time we were eight until we were sixteen. We did really well when we were given more attention. When we stopped playing piano and started playing guitar we both immediately excelled at it because we were encouraging and teaching one another. You know on a personal side of things, we are. Sara hates how much I talk over her, but I hate that I can't just tell the story I want to tell. Why do I have to have Sara tell it, it's my story! It’s pretty normal family stuff. SFS: Is that the reason why before this album you wrote separately? T: We always wrote alone since the beginning. It just me writing these private thoughts — really intense emotions and feelings — and until you get it figured out, or fixed in place, it feels like sharing something that is not yet complete. We always wrote parts for each of our songs and helped producer and engineer one another; but we never sat physically in the same room and wrote together. We experimented a lot with that on this record. We sent music back and forth and ended up writing ten songs together. They truly are the first ever Tegan and Sara songs. 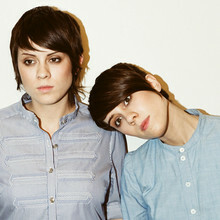 Everything else was written separate, so they feel like Tegan songs or Sara songs. The songs really are different. Listening to Sainthood now, eight months after it's been finished, I hear a song like "Paperback Head" and it doesn't sound like a traditional Tegan and Sara to me. SFS: What feels different to you? T: A song like "Paperback Head," specifically, started out more like a dance song. There were six of seven sequencers running all at the same time. Then I sent it to Sara, and she cut it a part and turned it into more of a pop song. SFS: Given the dynamics of you being in a relationship, and Sara being recently single during the creation of Sainthood, how did that affect your songwriting in comparison to The Con? T: Sara was in a relationship while we were writing The Con, writing about a coming breakup and I was writing about a breakup that had just happened. Both of us had been in five-year relationships. It was a really dark record for both of us. Sainthood was definitely written with a very different state of mind. I was dating, sort of falling in love, hopeful, and really wanted to shake off the darkness and demons of The Con, so I was writing much more high energy songs. Sara was also in this exploratory phase of dating, but writing about those anxieties and emotions of the pursuit of someone and being perfect to win them over. SFS: What would be Tegan and Sara's motto? T: Keep calm, carry on. Tegan and Sara perform at the Fox Theater on March 5th. Tickets are $35. Doors open at 8pm.